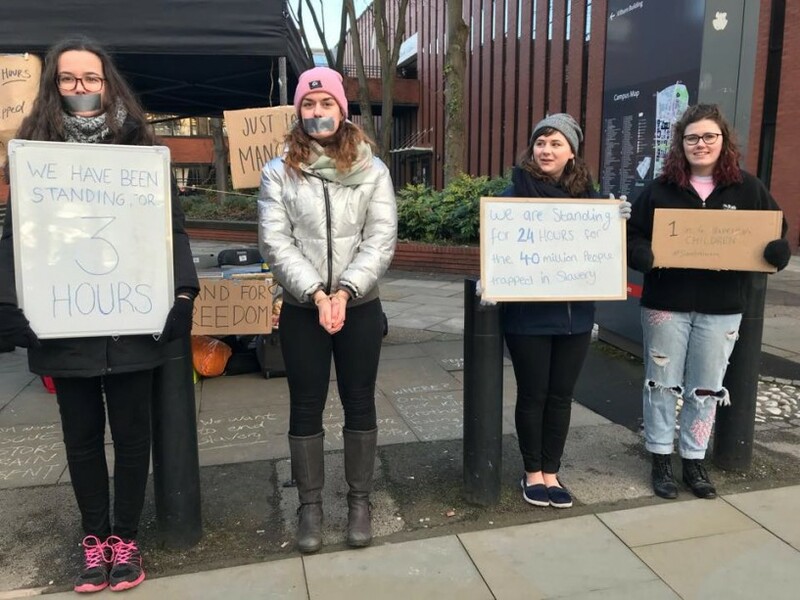 University students in Manchester staged a 24-hour vigil against modern day slavery at the weekend to raise awareness of human trafficking. The students are part of Just Love Manchester which supports the International Justice Mission, a campaiging organisation working to end slavery. Modern slavery affects around 40 million people worldwide in different ways, whether human trafficking or the exploitation of child workers. 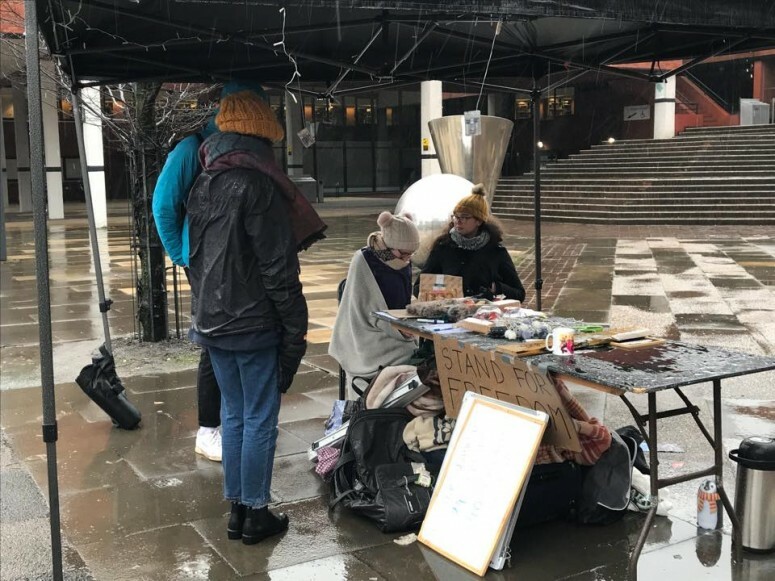 The students staged a protest by standing underneath a gazebo along Oxford Road near St Peter's Chaplaincy in All Saints. They held up banners from 12pm on Friday to 12pm the next day. The group kept up high spirits despite the cold weather and were joined by the Northern Quota to see what reaction they were getting from passers-by. 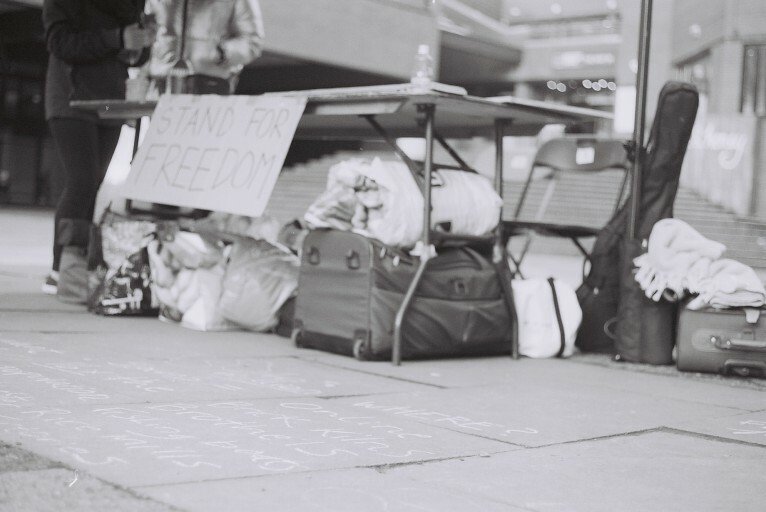 Law student Eleisha, 20, said: "We're standing out here for 24 hours to raise awareness for slavery. We're also asking people to make a pledge for freedom, asking them to give up buying chocolate or coffee that isn't FairTrade, or giving up high street fashion brands that use slave labour in their production line." The group’s aim was to collect 100 pledges and just four hours into the vigil they already had more than 30. Those taking part in the vigil said many people did not realise how widespread modern day slavery is. The Northern Quota witnessed a number of animated conversations between campaigners and passers-by, and the group said they had received a good response throughout the 24-hour vigil. The group's spirits remained high through the night despite the plummeting temperatures and kept awake beneath the gazebo with no beds and no warmth of any kind apart from the layers of clothing they had on. The students kept up their morale by singing and telling stories and while some students dipped in and out, a number stayed for at least 20 hours, with some staying to the end. Lydia, 21, studying law and politics, stayed at the gazebo for around 20 hours. She said: "It has been challenging, it has been fun and exciting to hear people and what they have to say about modern slavery, and to stop endorsing modern slavery. It's also brought us together as a community and a group." The group managed to collect almost 50 pledges and with support on social media, it definitely made an impact. Anyone wanting to find out more about the fight against modern day slavery can visit the group's WordPress site and Facebook page. A special thanks to Abi, Eleisha, Phillip and all the students who allowed NQ to take photos and interview them.